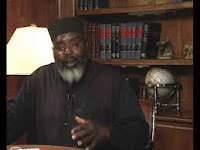 Imam Abdul Alim Musa is a Muslim activist, director of Masjid Al-Islam in D.C., member of the Institute of Contemporary Islamic Thought, popular speaker and, perhaps most notably, founder and director of As-Sabiqun, an anti-Semitic Muslim group (more here) that advocates for the creation of a global Islamic state that would abolish all “man-made” forms of governance, as well as the Islamic Institute of Counter-Zionist American Psychological Warfare. If the name of the latter suggests unhinged anti-semitism and conspiracy mongering to you, then you are entirely correct. Sometimes considered something of a cult leader, Musa is an outspoken fan of the political Islam embodied by Ayatollah Khomeini, and has made several visits to Iran as a (self-appointed) representative of Muslims in the United States and supporter of the Islamic revival (he frequently appears on Iran’s anti-semitic Press TV). According to Musa, the trans-Atlantic slave trade was operated by Jewish people: “Who ran the slave trade …who funded [it]? You’ll study and you will find out: the Jews…It was the Jewish bankers…in Vienna, with pockets full of money, funding and insuring, that’s who did it…. you can’t tell us about no holocaust. Between the African Americans and the Native Americans, everybody else’s stuff was small potatoes.” According to Musa, Zionist American agents were also behind 9/11 (“George Bush brings down the World Trade Center, blames it on us [Muslims] and then claims himself dictator over the world”). Indeed, the Israeli Mossad and the U.S. government are apparently behind 90 percent of the terror attacks in the U.S. and abroad since the 1993 World Trade Center bombing, including the attempt to blow up an American airliner heading for Detroit on Christmas Day 2009, designed to put deranged, fundamentalist violence-promoting theocratic conspiracy theorists like Musa in a bad light. It was apparently also the Zionist-controlled American government that flooded the country with heroin in the 1960s to snuff out the black rebellion. In general, the US is more or less controlled by Zionists – the government is “Zionist occupied” by “Zionists in Hollywood, the Zionists in New York, and the Zionists in D.C.” – who “all collaborate” to oppress Blacks and Muslims. No fan of the Arab Spring events, Musa claimed the whole thing was a Western conspiracy to “wipe Islam off the map”. Musa himself claims that his attacks are directed at Zionist supporters of Israel and not at Jewish people in general (“One of my best friends is a rabbi!”, claims Musa), which is somewhat blatantly contradicted by what he actually says. In 2009 Musa was listed as one of 22 people banned from entering the United Kingdom. According to the UK government, this was because he was “[c]onsidered to be engaging in unacceptable behaviour by fomenting and glorifying terrorist violence in furtherance of his particular beliefs and seeking to provoke others to terrorist acts.” He is. There is a decent resource on Musa and his groups here. Diagnosis: Though way less influential than the anti-Sharia crowd likes to think, Abdul Alim Musa and his groups are, it should be emphasized, more influential than many others seem to realize. He is, in any case, one of the most deranged lunatics alive in the US at the moment.